Getting a photofacial is the equivalent of getting a supercharged anti-aging treatment that will reveal a cleaner, brighter, tighter and even toned complexion in days. Photofacials utilize intense pulsed light (IPL) energy to improve sun damage, large pores, red complexions, and fine lines. The overall affect is a clearer, more youthful complexion. 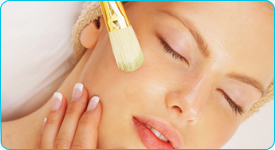 After only one treatment, your skin will have a more even tone with a smoother look and feel. Age spots will get darker, migrate to the surface, and slough off as part of the skin’s natural exfoliation process. Your skin and pores will feel and look tighter. Fine lines and wrinkles will gradually decrease in size. Patients will see better results and more improvement after each successive treatment. There is no downtime with the photofacial. After you treatment, you can put on makeup and go back to work or go shopping. The treated skin may appear a little flushed and capillaries may seem to be more visible. The flushed look soon fades away, and the capillaries appear to vanish, leaving the skin looking younger. You may feel a little hot or tingling sensation which should go away in a matter of hours. After each treatment, you should follow your home care instructions, avoid any harsh skin cleansers and always use sunscreen. Depending on the area treated, most clients need a series of approximately five treatments. Treatments usually take approximately 30 minutes. Treatments are spaced out at approximately three week intervals. Most patients describe the sensation to be like the snap of a rubber band on the skin as the pulses of energy are delivered through the handpiece. Some patients opt to have a topical anaesthesia. After treatment, the pain is minimal to nonexistent. leaving the surrounding tissue intact.